New Meeting Times in 2019. 6pm – 8pm the 2nd Wednesday of the Month! Our Monthly Meeting times have changed! Thank you for all the feedback from our community about the change in time. We have changed times to 6pm – 8pm so that more community members are able to attend our meeting. 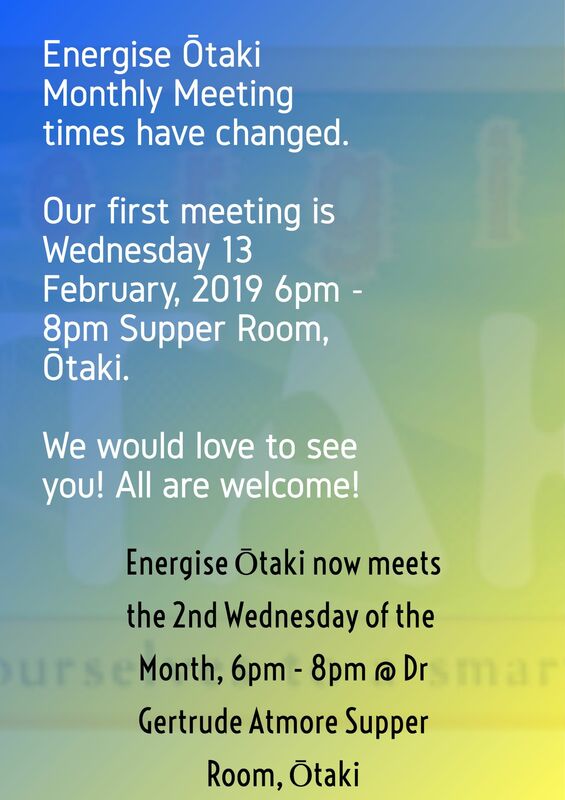 We still meet at Dr. Gertrude Atmore Supper Room at Memorial Hall, Ōtaki, but now on the 2nd Wednesday of the Month. We hope to see you there! 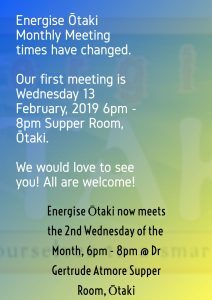 Our first meeting is on Wednesday the 13th February, 2019. 6pm- 8pm. Dr. Gertrude Atmore Supper Room, Memorial Hall, Ōtaki.